Garbage disposals are electrical devices that are installed beneath kitchen sinks just between the drain and the trap. These convenient devices shred food waste into pieces that are small enough to easily pass through household plumbing. Food scraps account for 10 to 20% of household waste, and garbage disposals drastically reduce the amount of waste that ends up in landfills. With a garbage disposal, food is converted into liquid waste which is them disposed of and managed via underground sewers and wastewater treatment plants. Garbage disposal installation is a straightforward process, and the professional plumbers here at GT Campbell Plumbing can finish the job in no time. Because the garbage disposal is an electric-powered device, it should only be installed be a professional. There are numerous models of garbage disposals to choose from, and it can be difficult to pick the right one. Ideally, you should choose a model with at least half horsepower. Generally speaking, the larger the garbage disposal the unit, the finer it will grind and the quieter it will operate. We also advise choosing unit with an extended warranty. 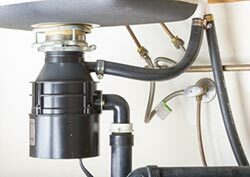 If you notice any problems with your garbage disposal, it is important to call a professional plumber right away. Working on a garbage disposal unit yourself can be dangerous, and problems can be very difficult to diagnose and correct. If your garbage disposal is growling, gurgling or not grinding up refuse as it should, your best course of action is calling a plumber who can correct the problem and extend the life of the unit. Thinking about getting a garbage disposal or replacing your old garbage disposal unit? For garbage disposal installation in Rochester and the surrounding areas, call GT Campbell Plumbing: Your trusted plumber in Rochester NY today.